Karl and I are always looking for indoor places to do photo shoots for the blog. Places that are spacious, have great lighting, not too distracting of a background, and we won’t be in the way. 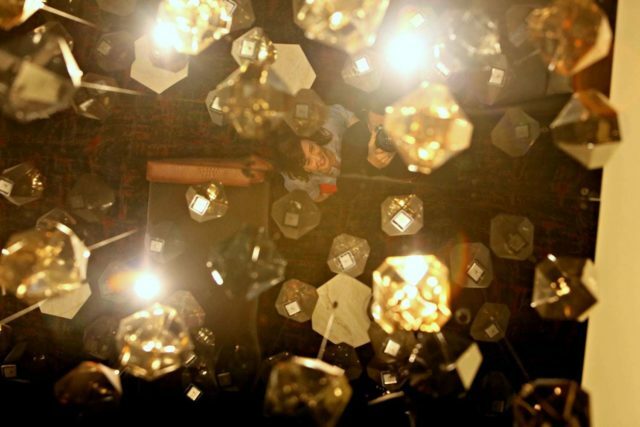 When the Hotel at the University of Maryland opened, it became a favorite place for us to take photos. It's a modern, elegant, and upscale hotel full of light and modern amenities. 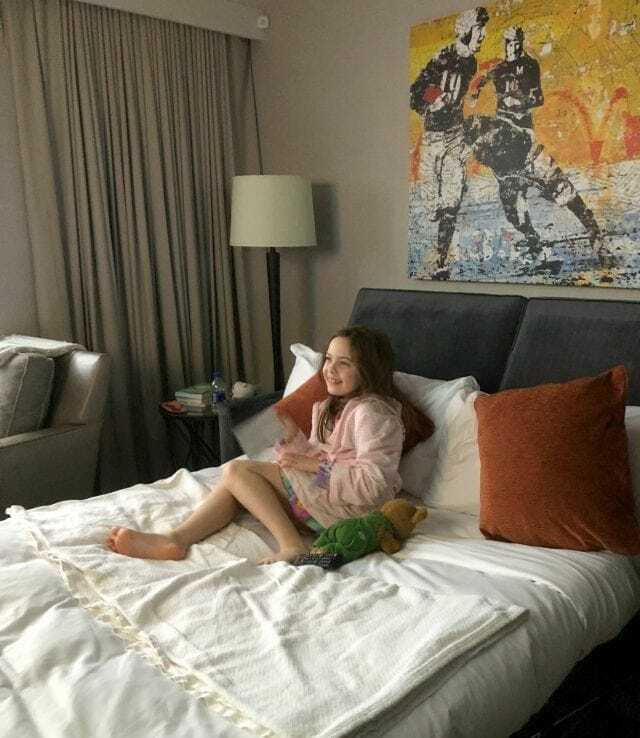 Emerson often joins us for these shoots and each time we’ve visited she’s wistfully said, “I wish I could stay at this hotel.” Emerson’s Spring Break was cut short due to so many snow days earlier in the school year, so we didn’t have the days for a long vacation. I reached out to the Hotel at the University of Maryland and asked if we could stay there for two nights for a staycation. They loved the idea, and so did Emerson! The Hotel is conveniently located across the street from the main entrance to the College Park campus. 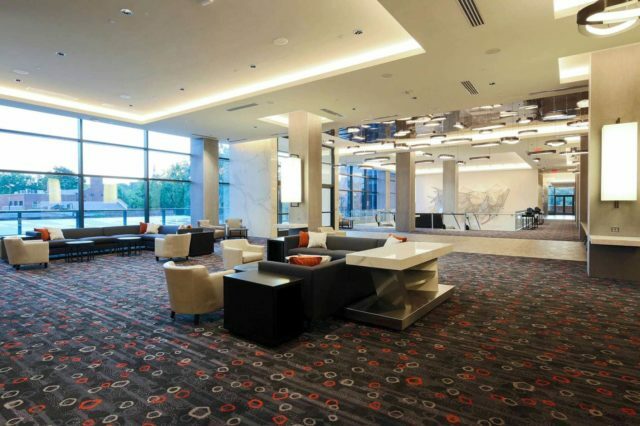 Less than an hour from three major airports, just down the street from a Metro stop, 495, 95, and the Baltimore-Washington Parkway, the Hotel at the University of Maryland is also a quick Metro ride or drive to Washington DC. The Hotel also provides a free shuttle to the Metro as well as destinations on the University of Maryland campus. 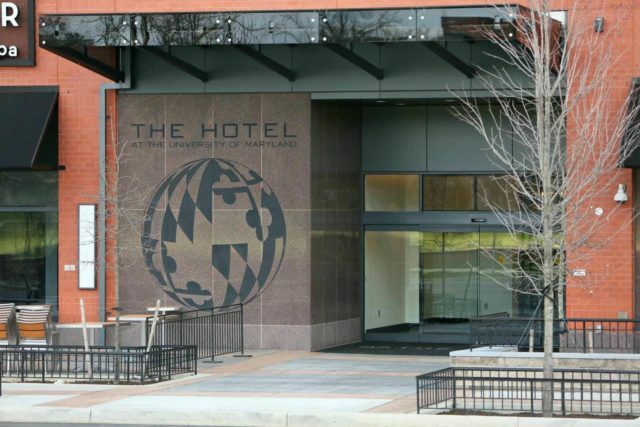 However, the Hotel at the University of Maryland is a destination in itself. 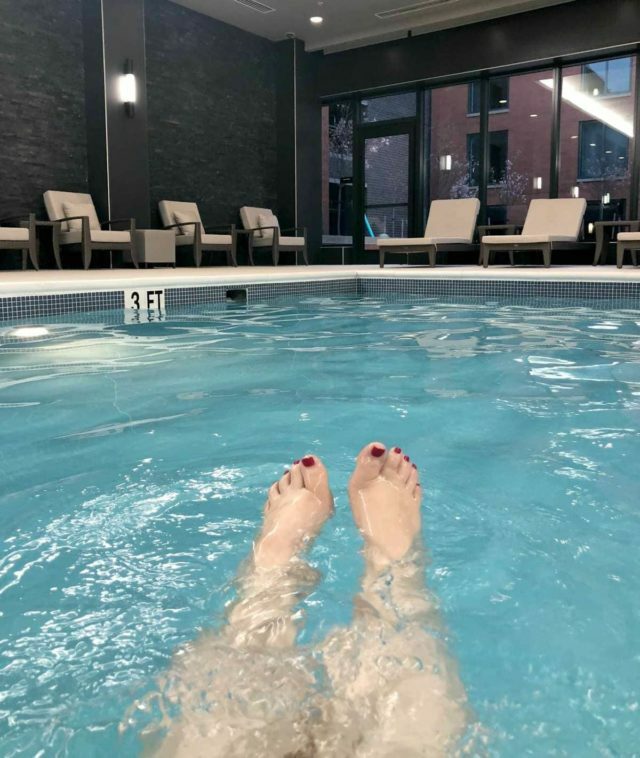 Four restaurants, a gorgeous lobby bar, shopping, a huge indoor pool next to a Zen garden courtyard, spacious fitness center, multiple conference and ballrooms for events of all sizes, and this month is the grand opening of their Elizabeth Arden Red Door Salon & Spa. The Hotel staff strives to make your experience great; even when we've visited before this stay they have been friendly, helpful, and informative. The Hotel at the University of Maryland set us up in one of their One Bedroom Suites with a king bed. When you enter the room, you’re in the living room, which has a sofa bed, chair, coffee table, kitchenette, electric fireplace, and huge television. Walk through the door to the incredibly spacious bedroom with a king-sized bed, desk, two closets, and another huge television. Open the double doors to the bathroom with a large vanity, huge mirror with flattering lighting, a huge shower, and a sliding door to a separate room for the toilet. 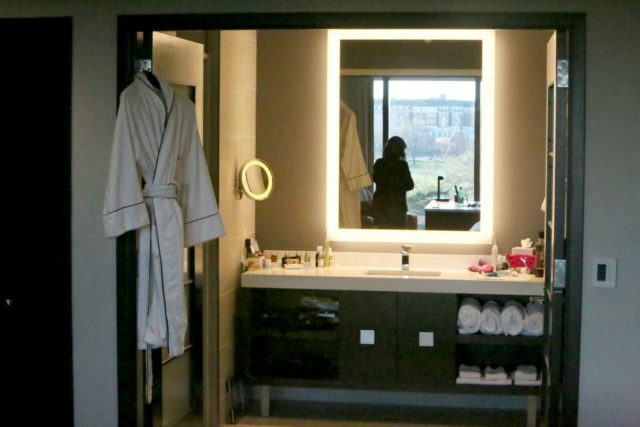 The toiletries are L’Occitane and the towels were large, thick, and absorbent. The room comes with a clothing steamer and a pretty decent hair dryer. The rooms had automated blinds and curtains over walls of windows with a view of the campus and Route 1. On a clear day if the trees weren’t so green at this time of year, you’d be able to see the Washington Monument. Every room at the Hotel has a mini fridge, safe, free WiFi, and 40” televisions. The beds are incredibly comfortable; I wanted to take it home with me! The Hotel welcomed us with a fruit and cheese plate and a bottle of wine and opened up and made the sofa bed for Emerson. Emerson was so excited and made herself at home in her room, while we unpacked in ours. All settled, we were hungry and decided to go downstairs for dinner. Since we were there because of Emerson’s suggestion, we let her pick the restaurant. No surprise, she chose pizza! Potomac Pizza has been a favorite in Maryland since 1978 and has a location in the Hotel at the University of Maryland. The restaurant is decorated in large black and white photographs of events at the University of Maryland over the years. Walk through and find images of Queen Elizabeth at a football game, famous alumni like Larry David, action shots of famous Terp athletes like Len Bias, and candids spanning many decades. We sat in a corner booth and above Karl’s head was a photo of students playing tug of war on Fraternity Row. Based on the clothing, I guessed it took place while I was there. Potomac Pizza has a guide to the photos and sure enough, the photo was from Greek Week in 1994! The restaurant is clean, modern, and more upscale than your local pizza joint. The menu is also quite varied. While Emerson got a pizza, Karl and I both got large, fresh salads and Karl also got a sandwich he said was delicious. 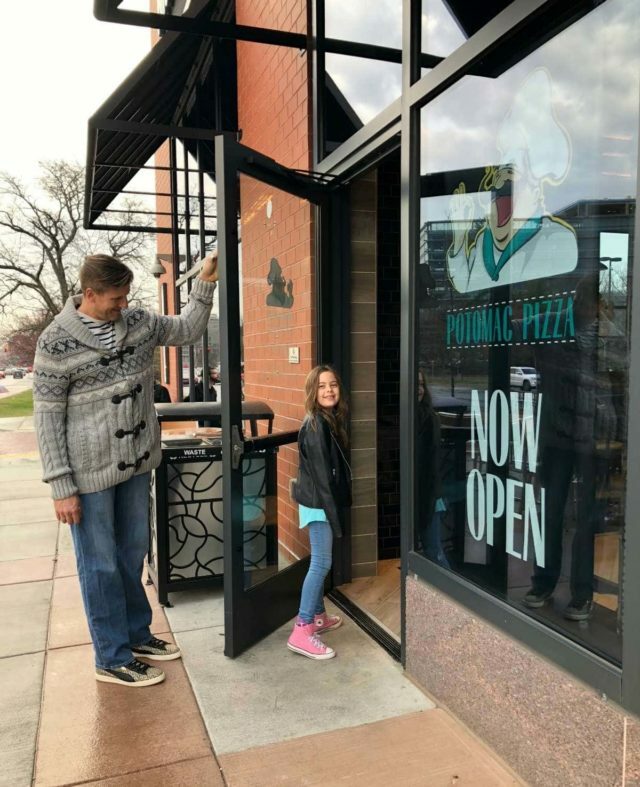 We had such a great experience at Potomac Pizza, we will return. When we got back to the room, they had come in with turn-down service. Little chocolates on our pillows, fresh bottles of water in the kitchenette. A very nice detail! Can I also just share how QUIET this hotel is? No sounds of showers or toilets flushing, no banging of doors, you can’t hear people in the hallways and can’t hear the traffic outside. The next morning, since we were so close to where we live (a true staycation! ), I went to my gym to work out while the family slept in. When I got back, I found that Karl grabbed us all breakfast from Bagels ‘n Grinds, another restaurant in the hotel. They make 16 different varieties of New York style bagels each morning and you can watch them do it. With a $50K glass-enclosed water treatment facility to have the right water for bagels, coffee, and sodas, Bagels ‘n Grinds ensures a delicious morning. My bagel sandwich and coffee was perfect, and based on the cream cheese on Emerson’s cheek, nose, and hair I believe she loved hers as well! This was Emerson’s vacation since she suggested the location so we let her make a lot of the decisions. And she decided we needed to spend the day at the pool. 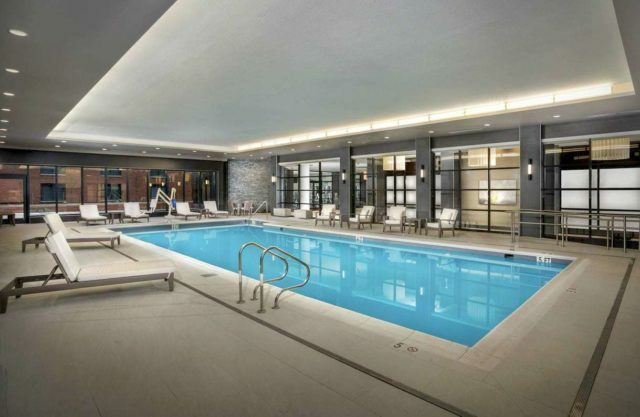 The indoor pool at the Hotel at the University of Maryland is gorgeous. It’s large enough to swim laps, plenty of seating, fresh towels, filtered water station, and super clean bathrooms. A wall of the pool looks out to their Zen garden, a courtyard that would likely be peaceful and beautiful but on this day it was extremely windy and rainy. No worries, we were having a blast in the pool and stayed until we turned into raisins. Karl checked out the fitness center which was as big as many gyms, full of state of the art machines, weights, and equipment. It too looks out to the Zen garden. On this day we had planned to visit the College Park Aviation Museum. Emerson went when she was much younger, but Karl and I had never been. The College Park Airport is the oldest airport in the world and this museum is part of the Smithsonian. It's a fun activity for adults and kids and walking distance from the Hotel. However, it rained and we stayed at the pool longer than expected. We'll have to save it for our next visit! Down the hall from the fitness center and pool is where Elizabeth Arden’s Red Door Salon & Spa will be. When we visited we only saw construction, but the space for it is huge. I’ll be sure to check it out when it opens and will share my experience with you! 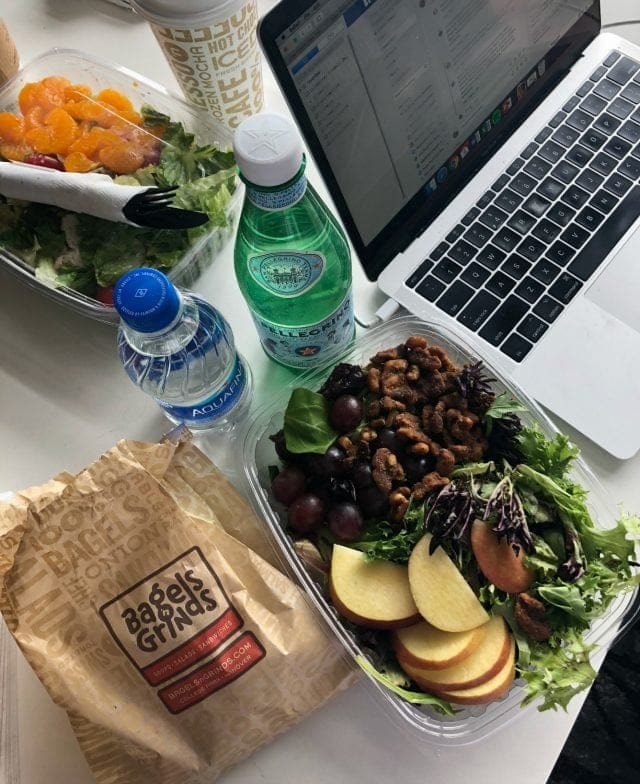 For lunch, we again went to Bagels ‘n Grinds where Emerson got a ham and cheese sandwich and Karl and I got some really nice salads. The perk of a staycation is you’re not too far from home. Emerson had her piano lesson that afternoon, so instead of cancelling, we headed back to our town for her lesson and I headed to the house to take care of some administrative things for the blog. We came back to the hotel and changed for dinner. For this evening’s dinner we decided to visit Old Maryland Grill. 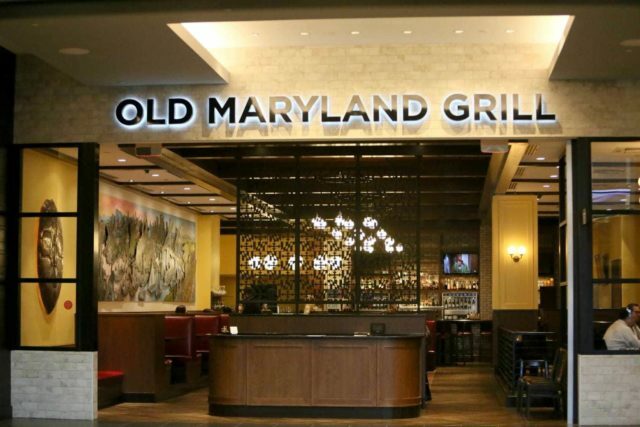 We’ve been to Old Maryland Grill before and think it’s great. OMG was started by Mike Franklin, who also owns Franklin’s, an extremely popular restaurant, brewery, and general store in nearby Hyattsville, Maryland. Old Maryland Grill focuses on Maryland dishes, using locally sourced ingredients. A fantastic raw bar, inventive cocktails, and a menu to appeal to most anyone, we had yet another great meal there – Karl got fish, I had steak, and Emerson enjoyed chicken fingers. Salt water taffy comes with your receipt – such a cute detail! The next morning I got up early to go to the gym, stopped by the Starbucks in College Park (though each room has a coffee maker with Illy coffee) and brought back java. We fit in a few outfit shoots but soon had to head home and get ready to go back to school. 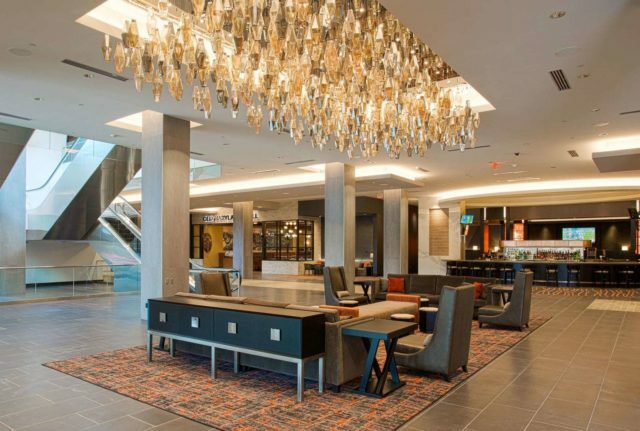 But Emerson’s idea was genius – the Hotel at the University of Maryland is gorgeous, so clean, amazing staff, and a true destination within itself. This is by far the best hotel in the area, and the one I will now recommend to those visiting the area. Thank you to the Hotel at the University of Maryland for such a lovely staycation. We will be back! There is room service. I didn’t notice this on the website, but they have menus in the room. I believe it’s open until 10pm. If you require non-feather pillows, let them know when you make your reservation or when you check in. They have them available and are happy to switch them out; otherwise you get a mix of feather and synthetic filled pillows. Park in the garage one floor above the floor you’re staying on (for example, we parked on 8 while our room was on the 7th floor). When heading into the hotel, don’t take the elevator on the right, instead take the door to the left. You’ll end up on your hotel floor. Very convenient for packing and unpacking! I always bring an adapter or surge protector with me on travel to have additional electrical plugs; it was very useful at this hotel. The outlets under the desk can be hard to reach and there’s not a lot of room if your appliance’s plug is bulky. The rooms have garment steamers, not irons. I love this, but it’s important to note if you’re expecting an iron. The Hotel has a shop in the lobby which has gifts, but also snacks and essentials you may have forgotten to pack. The Hotel’s lobby bar is bigger than you may think. It’s a circle, with seating all around and tables behind. The bar serves small bites along with cocktails and other drinks. There is a second lobby up the escalator, it’s a nice place to go read a book or connect with friends before going out for the day since it’s not as busy. It’s the location used for this outfit shoot and this outfit shoot. Every restaurant except for Potomac Pizza can be accessed from the hotel lobby. Potomac Pizza is a very short walk out the Route 1 entrance of the Hotel. Many of the restaurants in the Hotel will validate parking if you dine there. There isn’t free parking in College Park. If you plan to head out to shop, dine, or sight-see, consider walking or taking the hotel shuttle so you don’t have to keep feeding meters. The shuttle will take you for free anywhere within three miles of the Hotel. 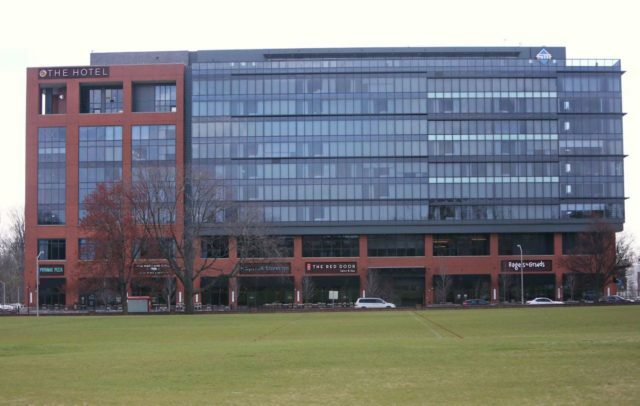 This gives you access to the Metro, the University of Maryland campus and its sport and event venues, downtown College Park, Riverdale Park Station (has a Whole Foods, Gold's Gym, and several restaurants), and IKEA. If you take the Metro, you’re on the Green Line which is a straight shot into popular parts of DC like U Street, Chinatown and the Capital One Arena (where the Capitals and Wizards play and many concerts take place), L’Enfant Plaza, and the Nationals baseball stadium. Hanami – If you’re craving sushi this is my favorite in College Park. You can walk to it from the Hotel, it’s in a strip mall about a block away. Burton’s – Located in Riverdale Park, this restaurant is delicious but also great for those with specific dietary needs or allergies. 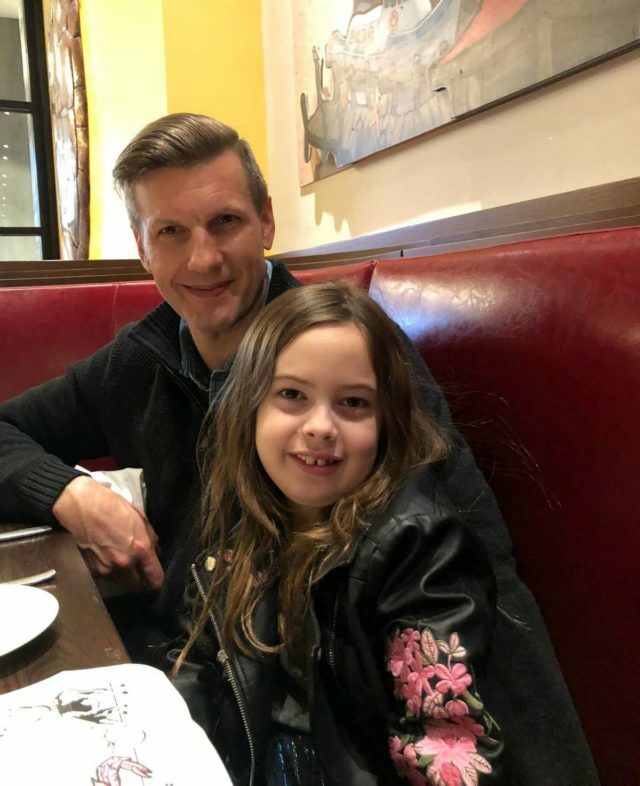 I share more about Burton’s in this blog post, but it’s a lovely restaurant for date night, a family meal, or cocktails with friends. 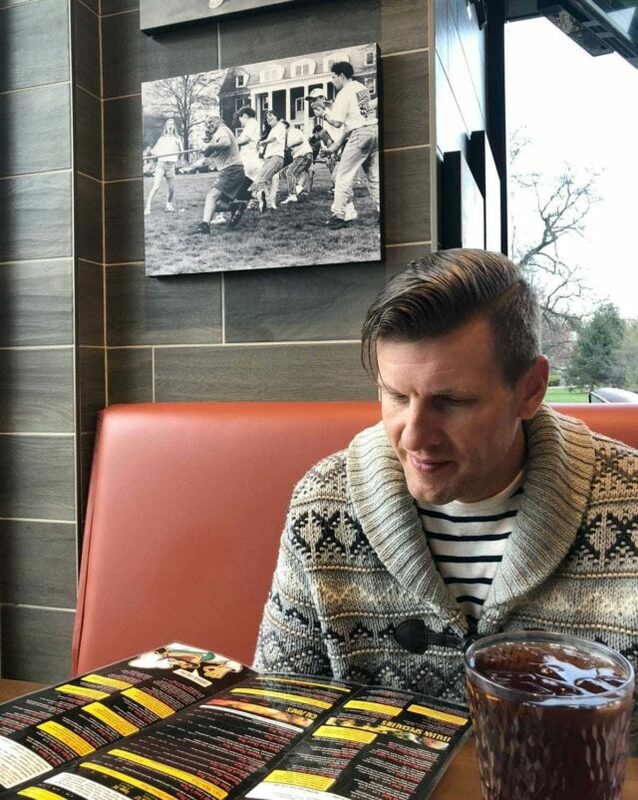 The Original Ledo Restaurant – Ledo’s pizza is a Maryland institution. The pizza is thin and square. The original Ledo was in a neighboring city, but they outgrew the location and moved to a gorgeous space in downtown College Park. There's far more than pizza on the menu, and they have a really nice bar too. Only a half mile away down Route 1, it’s a nice walk on a beautiful day. Fishnet – If you follow me on Instagram Stories you know my family and I love this place. If you didn’t know about Fishnet you’d never find it, it’s up a street from Route 1 in a neighborhood. But it’s worth a visit for really fresh delicious seafood sandwiches and entrees. They have outdoor picnic tables and a decent wine and beer list. While there, check out Smile Herb Shop! Gus’ World Famous Fried Chicken – I also wrote about Gus’ on the blog; the chicken is amazing, the sides are delish, and the restaurant itself is quirky and creative and staffed by friendly folk. NuVegan Café – For those who have a plant-based diet this is a great restaurant. Even if you’re not vegan you’ll love the flavorful and familiar dishes. A focus on soul food, but something to please any palette. NuVegan is less than a 10-minute walk from the Hotel. The Board and Brew – Looking for something to do with your beer or cup of Joe? The Board and Brew has over 500 board games you can play while you drink and eat, and many nights they have live music. The Board and Brew is in the same place as NuVegan, so it too is easy to walk to from the hotel. Vigilante Coffee – I’ve shared my love for Vigilante Coffee many times on this blog. They recently opened a location in College Park, and it’s walking distance from the Hotel. Amazing coffee, good vibes, and free WiFi during the week. I received a free stay at the Hotel at the University of Maryland and gift cards to dine at Potomac Pizza and Bagels ‘n Grinds but all thoughts are my own. If I ever get out your way, I’ll be sure to stay at this hotel. I looked up the room prices and I was pleasantly surprised. Being on the East Coast and being so upscale, I thought the room prices would be about double of what they are. Emerson is so fortunate! I think you fulfilled one of her fondest wishes. Coincidentally I am going to a conference next week and be staying at a hotel that it on a college campus too. In my case the hotel is AT&T Executive Education and Conference Center at the University of Texas at Austin. It’s not quite as nice as your hotel in Maryland, but it is pretty great. It has state-of-the-art computer classrooms which is perfect for the type of training conference I am going to.